Montorio is located just outside the town and it is in a walking distance to town, but I always suggest to have your car because there is so much to see in the area and the public transport are really poor. On my experience I see that most of our guest arrive from Florence or Rome, by plane, rent a car at the airport and came to our place, but with a lot of difficulty. 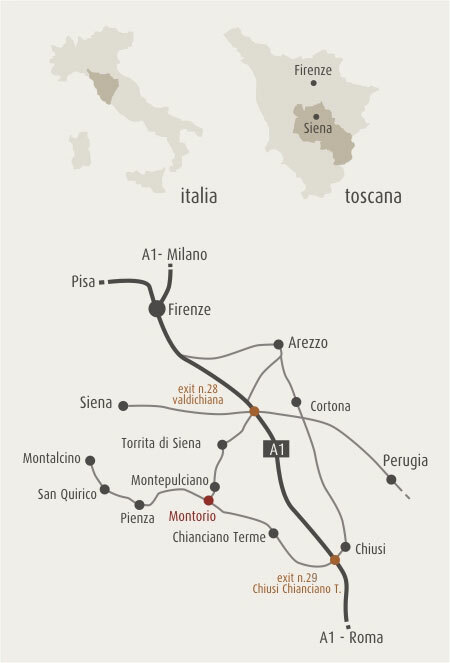 My suggestion is: take a train from Florence or from Rome to CHIUSI, wich is located at 25km from us. This is a small train station but there are the major rental cars as, Hertz, Europecar and Avis, located just few steps from the train station. Of course book in advance your car, but this make the difference because there is not line, since is a small town and mostly wont be too much stress to drive from Chiusi to Montepulciano. Take the A1 motorway, exit at Valdichiana-Bettolle (exit No. 28) and drive through the village of Bettolle in the direction of Torrita di Siena. After 6 km you will arrive at Torrita di Siena, at the blinking traffic light turn left in the direction of Montepulciano. After 1.5 km at the roundabout turn right in the direction of Montepulciano. After 7 km you will arrive at Montepulciano, at the traffic lights turn left in the direction of Pienza-Chianciano Terme and drive around the town. After 1.5km, you will be at a crossroad, the entrance of Montorio is to the right in front of you (the road that turns right just prior to this goes to the church of San Biagio). Take the Highway A1 (Autostrada del Sole) and turn off at the exit for Chiusi-Chianciano (no. 29). Follow the road signs for Chianciano Terme (circa 10 km). Pass through Chianciano and drive on to Montepulciano (circa 9 km). On arriving in Montepulciano you will find an intersection called the Bivio di San Biagio. There you will find a sign indicating the private road for Montorio 50 metres ahead of you. - Pay at the toll gate when you exit the motorway, using the ticket. • AVIS Car rental. Phone 0578 228130. • Europecar 1 Km from the railway station. Phone +39 0578 222012. * If you plan to arrive/depart during the week-end no worry. We have a new professional partner wich has a rental car in front the train station of Terontola (26km from Montepulciano) they are open during the week and on appointment also during the week-end you can contact them at www.autonoleggioilgirasole.it , they have also a driver service.